Book historians tend to compare features of the medieval book to body parts. Thus the manuscript’s “head” (top edge) is connected to its “spine” (the back) via the “shoulder” (the area where board meets spine). There are even terms that compare a medieval book’s physical features to human activities or conditions. A large letter with a lively figure inside is called a “gymnastic initial,” for example, while line ruling that is nearly invisible is “blind.” This article takes this projection phenomenon a step further. 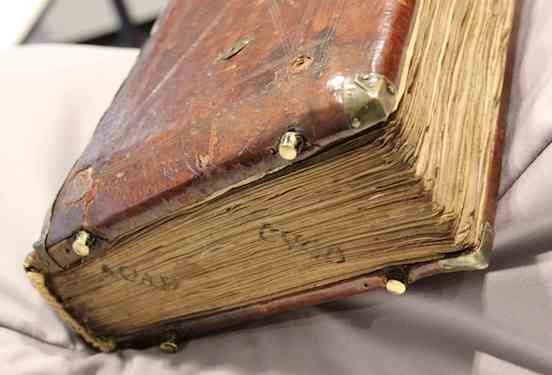 It shows how one particular feature of the medieval binding eerily resembles a body part, not just in appearance but even in function: the clasp. While a medieval book was produced to be opened and used, medieval makers of manuscripts paid just as much attention to closing it. In order to preserve the organic pages, which were often made of parchment, it was necessary to keep the volume tightly closed when it was not used. Not only did this keep moisture out, but parchment also has a natural tendency to buckle, especially when handled at room temperature. In fact, parchment pages curl up with so much force that the wooden boards would be pushed open were it not for a smart device designed to keep the lid on: the clasp. The clasp is like an arm that extends from the one wooden board to the other. Indeed, it is hard not to think of clasps as hugging arms that embrace the leaves, safeguarding them from the harsh reality of medieval book use. Appropriately, the primary purpose of clasps was to protect the pages. They generated the pressure needed to keep the pages flat, while producing a firm object that could withstand every-day use in a medieval library—like falling off a desk or a shelf. At the end of the arm a tiny “hand” locks into an extension, as clearly visible in the image above. 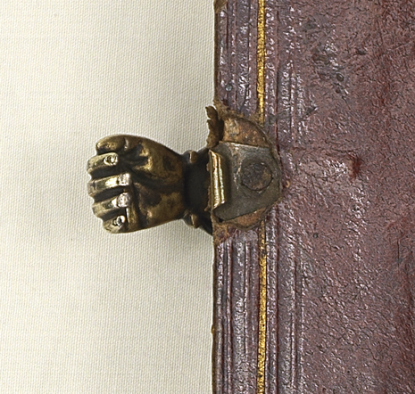 How great that some book binders played with the image of a hand grabbing onto the opposite clasp, as this eighteenth century example shows (above). Generally, two clasps were able to contain the force issued by the buckling parchment of a book. However, it was important to get it right as a bookbinder. When the distance between the one end of the arm (the “arm pit”) and the handle bar was too large, there was insufficient pressure. By contrast, if the distance was too little, the book did not close. 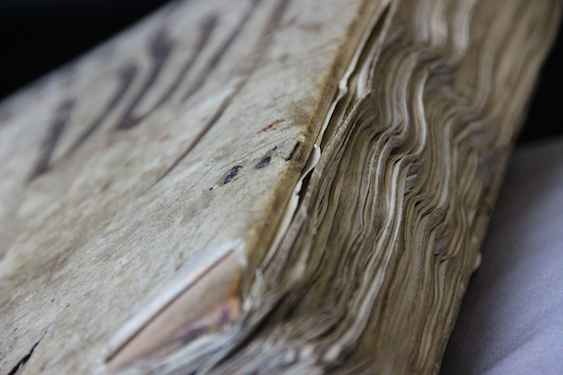 Medieval manuscripts that have lost their clasps (by far the majority) show what happens to the bookblock when the pressure was too low: unhappy pages with a wavy pattern appeared (above). Some readers preferred exotic clasps. A particularly remarkable specimen is in the National Library of Sweden. The book it helps to close is tiny, no larger than an iPhone. Made c. 1500, it was designed for the road: it concerns a portable Book of Hours (or prayer book) that was carried around by a pilgrim on his religious pilgrimage. The clasp holding it closed is in fact a skull carved out of bone. The theme is fitting for a pilgrim seeking redemption, finding his way along the dusty roads of medieval Europe. Every time he sat down to open his book he was confronted with his future, which looked rather grim: Memento mori, remember that you will die one day. Better smarten up and keep on going! The exoticness of clasps is sometimes connected to their number instead of their shape. Clasps are a must for a peculiar binding known as dos-à-dos (or “back-to-back”). While such bindings usually hold two books bound together at their backs (hence the name), the National Library of Sweden owns a unique variant that contains no less than six books. They are all devotional texts printed in Germany during the 1550s and 1570s (including Martin Luther, Der kleine Catechismus) and each one is closed with its own tiny clasp (see the various openings here). A book with six arms and hands: it is quite the display of craftsmanship. 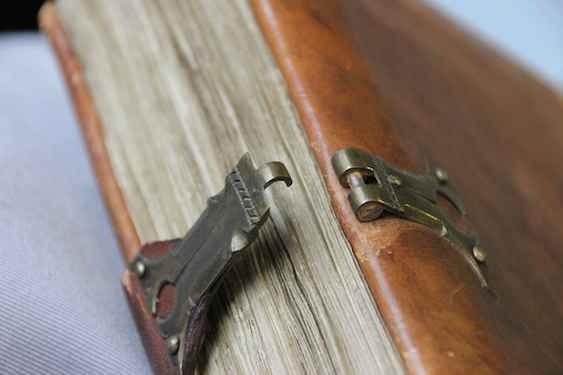 If clasps can be compared to arms, another feature of the bookbinding must be called “feet.” During the later Middle Ages it became customary to store manuscripts on lecterns. In lectern libraries, which were found in monastic houses and churches, readers consulted books on uncomfortable benches. The libraries often had a semi-public function, with outsiders walking in and out to consult books. 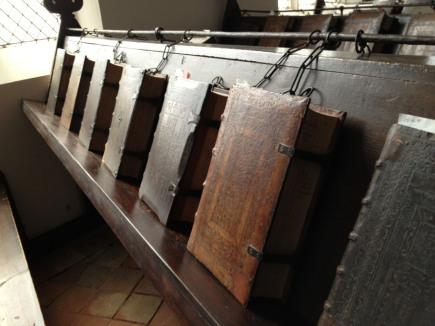 To facilitate such use—and to make sure no books were unlawfully removed—the objects were usually chained to the lecterns (above). Books in lectern libraries were not read on a flat surface (such as a desk), but erect – the objects were resting, after all, on nearly vertical stands. This kind of use came with a challenge: the shuffling that inevitably happened when the book was read, wore out the lower edge of the binding. More importantly, since the medieval book block was flush with the binding, the constant contact with the lectern as the reader flipped through the book could easily damage the page. 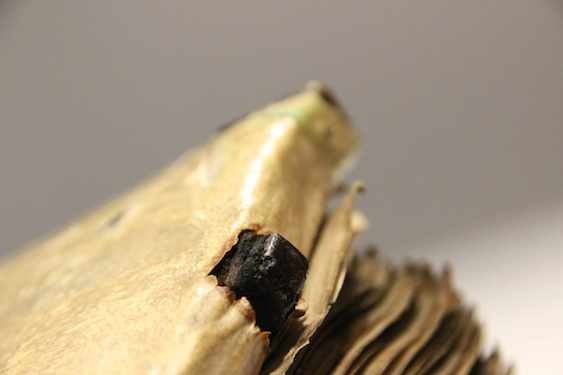 A simple tool was invented to prevent such damage: “feet”—tiny pieces of brass that hoisted the book up and made it hover, as it were (above). The feet that are attached to bindings are often shiny. It shows just how much the book was used—and how much damage was prevented by the attached feet (see below). There is something very attractive about these body parts. They show just how much bookbinders and readers were in tune with the needs of the book as an object. They packaged them so that they could withstand rough consultation, while their designs also left room for a certain amount of fun—as the hand-clasp and perhaps even the skull-clasp shows. The hug given by these strong arms protected the book’s most precious cargo, the text, both from accidents in the medieval library and, as much as possible, from the inevitable decay of time. Cite this page as: Dr. Erik Kwakkel, "Clasps: hugging a medieval book," in Smarthistory, August 8, 2015, accessed April 21, 2019, https://smarthistory.org/clasps-hugging-a-medieval-book/.